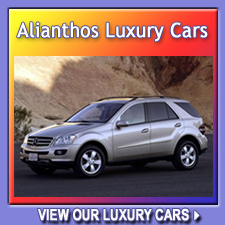 We offer a great variety of last years cars equipped with the latest technology, to meet all your demands: small or bigger cars, with air-conditioning, with open top, 4x4 jeeps, cabriolet, luxury and mini buses. And all these with the lowest rates and the best rental conditions. 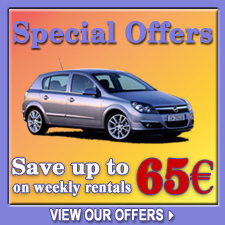 ALL TAXES, UNLIMITED KILOMETERS AND MANY RENTAL SERVICES FOR FREE. 01 Jul. - 15 Sept.
ALL PRICES ABOVE ARE IN EURO (€). TO CONVERT PRICES TO DIFFERENT CURRENCY CLICK HERE. Our prices are the lowest of the market while at the same time include a variety of car rental services FOR FREE for which other companies will either charge you openly or you will find the costs hidden at the end of the day.